Blazer Dancers in New Playoff Catsuits? Rawr! Anyone else notice those fantastic new Blazer Dancer outfits? Those would be the new Playoff Dancer uni’s that we are quickly dubbing as the “Catsuits”. It’s been a while since we’ve had some new and exclusive photos of the hottest dance team in the NBA hasn't it? We’ll apologize for leaving you hanging but expect many thanks for bringing it home with these lovelies. I’m thinking that these rank with the best of them…what do you think? How can you not love some black knee highs? Better than the red boy shorts? Or the Wonder Woman-esque outfits? The Christmas uni’s are always a favorite. Anyway, enjoy. Oh heck yeah dude lookin real good! I don't know the girls look good, the outfits, could be better. Its someone with a digital camera...why would you be expecting some professional photog? I like picture 4. But I approve of all changes. Hottest dancers in the league? I don't think so. Maybe by Portland standards, but have you seen Portland women recently? They aren't the most attractive. In fact, I'd go as far to say that you may be able to label them not attractive. Sure, the dancers look good, but they've looked 1000x better in past years and in no way are they the hottest in the league. Orlando's dancers look good and do trampoline dunks with flair. I'd wager that one point this year a Blazer Dancer broke a nail and cried about through her uber fake smile. These girls look like they belong in L.A. Way to be fake, girls!! Wow bitter and angry Portlanders. The exact problem with this city. Fake? You guys don't leave Portland. Seen the east coast, az or cali lately? Some jealous women judging people who have worked hard. Funny how it's so easy to judge someone's daughter before you know her. How about congrats for accomplishing a childhood dream or something. Keep it up ladies! Welcome everyone else to the world of sports. I left that comment about them looking fake, and I'm male and am from Oregon, but living on the East Coast. They don't look like NW women. They look like they belong in L.A. (or maybe the NE, or AZ. I don't know I haven't spent any time there). Ben on ("Dave's family values") Blazer's Edge posts about shoes, and you post beautiful women in skimpy outfits. Not that there's anything wrong with being in the shoe closet, but I think I prefer your focus. An angry feminist goes off....demanding an end to the Blazer Dancers, and puts this blog on her target list. That is fantastic. I love a good feminist battle. SERIOUSLYY?!?!?! 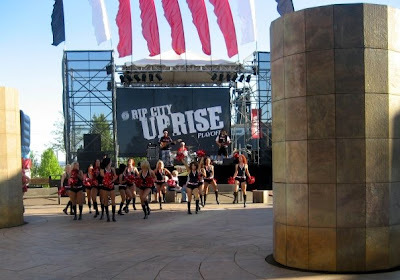 the blazerdancers are FAMOUS for being the most conservative pro dance team in the sports world, both NBA and NFL. The only team without briefs and bikinis with heels as uniforms. Watch an actual road game on tv or check out the websites of ANY other NBA or NFL team before you try to accuse the Blazerdancers of being too sexual or inappropriate. LIVE YOUR OWN LIFE, QUIT HATING.